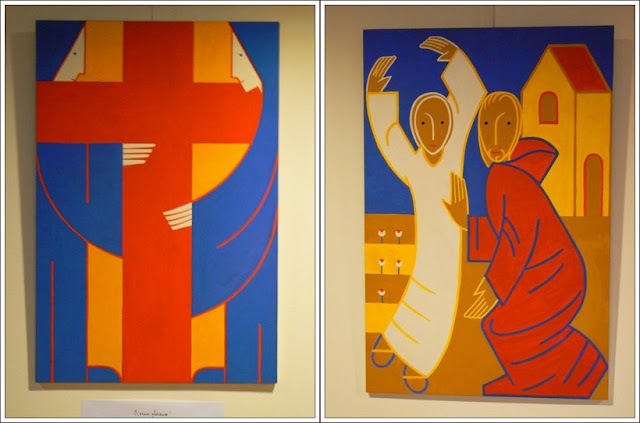 Le Centre National d'Art Sacre de la cathédrale présentait une exposition "Quand l'Art sacre contemporain prend sa source dans l'art roman" des œuvres de Frère Yves de la communauté bénédictine de l'Abbaye de la Pierre qui Vire (Yonne). 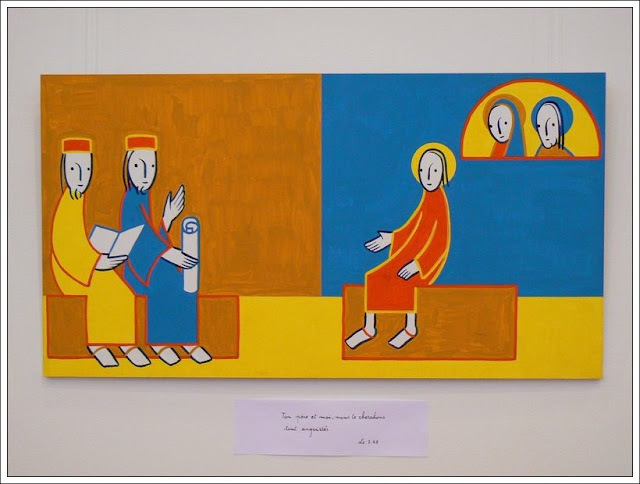 The National Center of Sacred art of the cathedral presented an exposure “When the contemporary Sacred art takes its source in the Romanesque art” of works of Brother Yves of the community bénédictine of the Abbey of Pierre-Qui-Vire (Yonne). I like this art very much. The colours are bold, and the figures are so contemporary. Benedictine communities are also so welcoming! I like the orange and yellow colors. The paintings look very African to me but I know Brother Yves is French. very interesting, I like these paintings. Thank you for the beautiful comments on yesterday's daily photo of Malta. Cheers,Laetiti (aka marie6). Thank you for showing us these remarkable pieces of art, so "simple", modern, but clearly inspired by roman art! Ses oeuvres sont composées comme on devrait composer les photos et à la fois sont toutes simples. Et pourtant c'est un ami d'enfance. I love these paintings. They are so colorful and peaceful at the same time. Thanks for introducing us to the works of Frère Yves. I look forward to seeing more tomorrow! Interesting drawing style, but very nice. I love everything that has to do with Christianity anyway! The one drawing shows us the cross, it reminds us about what Jesus did on the cross for mankind. I was not familiar with the art of Brother Yves - thanks for introduction! i think i like this series! it's a contemporary view of famous scenes. These are wonderful, colorful yet stark, modern yet echoing traditional forms and themes. Thanks for showing us the work of Brother Yves. Si vous apparaissez sur mon Daily Photo et que vous ne le souhaitez pas, un petit mail de votre part et je retire votre photo. All photos and content Copyright 2005-2017 Perrin Olivier. All rights reserved.